Samoa Events is a small outfit. We create and run multi sporting events that promote Samoa as the adventure and sporting tourism destination of the Islands – the ‘Action Capital of the Pacific’. We also run a series of local events that are focused in building participation in multisport and encouraging healthy lifestyles through physical activity. Our international Events include the popular Samoa Swim Series, Warrior Race (Half Iron & Beat the Heat), Apolima Strait 22.3km Swim, Ford Cycle Tour of Samoa, Lalomanu Half Marathon, Samoa Perimeter Relay, Five Islands Swim and more. On the local scene, we run a six month Tri Series, a monthly Run Series and local Open Water Swim meets. There is also the Weekly Family Run Series during Daylight Saving months. 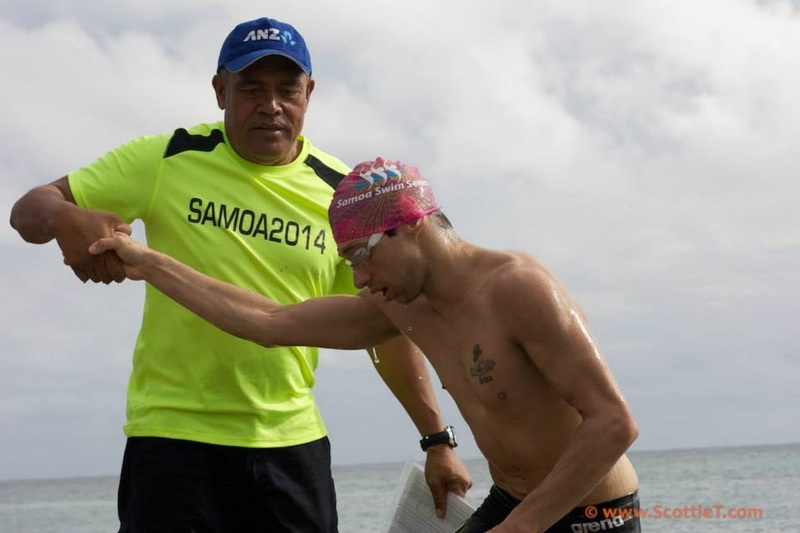 Samoa Events is run by Seti Afoa (Director and sole Employee) an avid open water swimmer and advocate for promoting Samoa as the premier sports tourism destination in the Pacific. The fear of the deep drew me to Open Water Swimming. I took it up rather late in life at the age of 49 years. And I took to it like a duck to water. I remember my first foray into the harbour with members of our swim squad. It was a Sunday afternoon swim, a regular activity for the group in St Heliers on the weekend. I was petrified at the first marker and had to be assisted back closer to shore where I swam in the safety of the sand while the rest of the group went out further. That was in 2009. A lot has happened since. I gained confidence very quickly, to the point where safety in numbers out in the Open was not required any more. I began to swim a lot on my own, further and further each time. Regular training at Jellicoe Pool in Onehunga close to where I lived, plus participation in the Open Water swim circuits around the city made me a proficient swimmer very quickly. I was not fast, but I could last a long time in the water where I was the happiest. That is unusual for Samoans. Most of us do not swim, or know how to swim despite our origins in a Pacific Island where there is more water than land. That connection to a Pacific Island and my new found freedom in the water was the start of what has become Samoa Events. In 2011 after a morning training with the squad at coffee time afterwards, one of the crew suggested we go for a swim tour to Samoa. It wasn't my idea. But being the only Samoan in the squad, and the pool for that matter, I became the organiser of the trip in 2012. There were 22 of us, and we spent eight days in Samoa on a swimming holiday. That was a great tour. The next year, the Samoa Swim Series was born. The concept was simple - 3 Great swims in 3 Days in three fantastic locations. The first Series in 2012 was amazing. Things grew from there. The next year in 2013, the Pacific Open Water Challenge 10km and 5km swims were added. Also, the Warrior Race Half Ironman was added. The next year in 2014 the Tour of Samoa was also added to the programme. The annual and international events is complimented by a great local programme of swimming, biking and running. I am grateful to the many people that come from all over the world to participate in our Events. The key for us is people, delivering great personal experiences in our events is what works for Samoa Events, our participants and our partners. In addition to running Samoa Events I also work as a Journalist in contract to a few publications (NZ and Samoa) covering Boxing, the All Blacks, Rugby and Politics. When I am on island, I co-host a Breakfast Show on Magik FM. Family-wise, Michelle and I have five adult children, four girls and Nicholas who is the eldest. He is currently playing Simba in the West End Production of Disney's The Lion King. The longest swim I have done. No one was doing these distances back in 2012 the year of this swim, now 10km+ swims is a regular occurrence.